Over 25 years ago, The New Music Seminar had dominated the New York indie music scene as one of two go-to events (the other being CMJ's Music Marathon) for bands, managers, rock critics, concerts bookers, club owners, deejays, and every other kind of this world's denizens to network and get business done outside the major labels' control. It has been revived and is an organization that looks to “create a new economic model that rewards artists, their investors and those in artist services” is organizing the New York Music Festival across 17 venues from June 17th - 20th, 2012, in addition to the seminar itself. Part concert, part indie music summit the 2012 New Music Seminar & NY Music Fest brings together musicians, and industry movers-and-shakers coming to discuss and consider different views on the future of the music industry and how it can better help artists. Calling all jazz lovers out there! The Django Reinhardt NY Festival returns June 19-24, 2012, at the great Manhattan jazz club Birdland for another year of jazzy music with the "Young Lions of Gypsy Jazz" from France featuring artists Anat Cohen (saxophone, clarinet -- June 19 & 20), Cyrille Aimee (vocals -- June 23 & 24), and Grace Kelly (sax -- June 21 & 22). The International Society for Improvised Music Festival 2012, taking place February 16th – 19th at William Paterson University in Wayne, NJ, will kick-off 9am Friday morning with a distinquished Keynote Panel featuring Karl Berger, founder and director of Creative Music Studio, and Douglas Ewart, Chair of the Association for the Advancement of Creative Musicians. The panel's presentations and discussions will focus on the interactions that took place between members of Creative Music Studios and AACM during the 70’s and 80’s, and the repercussions that are still being felt today. "The discussions concerning the philosophies that governed CMS and AACM should prove to be ofgreat interest to the new generation of improvisers today, " said Berger, who has been actively developing improvised orchestras for the past forty years. Berger, the co-founder with Ornette Coleman and Ingrid Sertso of the legendary Creative Music Studio and its parent organization, the Creative Music Foundation. CMS is credited as the birthplace of Worldjazz - the improvisational and compositional expansion of the world's musical traditions. Now one of the main driving forces in many styles of music, this concept was pioneered very early at CMS, guided by authentic leaders. Hundreds of live concerts were recorded, many heralded as landmark performances. Thousands of workshops, master classes, concerts and colloquia inspired a generation of musicians who took with them the ideas, concepts and practices developed with Berger. The CMS community still exists in a remarkable network of creative musicians, many of whom came to the studio from Asia, Europe and South America. Fellow panel participant Douglas R. Ewart is a composer, improviser, sculptor and is internationally recognized as one of the world’s most important talents in improvised music. 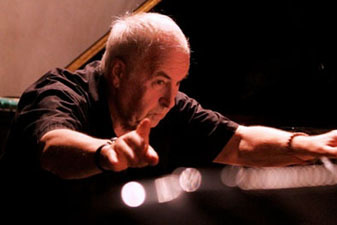 Saturday events conclude with an evening festival concert directed by Karl Berger with the 25-member University of Michigan Creative Arts Orchestra. A key component of this concert will be the CMS model of a site-specific open workshop followed by a complete orchestral performance. The event has already begun, so act now! The Telluride Jazz Festival will be marking its 36th year of bringing world-class jazz music to Telluride, CO. A not-to-be-missed musical extravaganza, the event has earned international acclaim for its showcasing of the absolute best in classic, mainstream, blues, Brazilian, African and Latin Jazz. The festival is a celebration of the art, soul, history and future of jazz that everyone can enjoy. It is scheduled to take place on August 3rd to the 5th at Telluride Town Park. Performances will take place outdoors in the daytime and in exclusive intimate clubs and historic concert halls at night. A complimentary wine tasting featuring over 20 varietals will take place on Saturday afternoon for all festival attendees. A five-time Grammy Award winner and winner of every major award give to a bass guitarist including being voted Bassist of the Year in Bass Player Magazine three times. Named by Rolling Stone Magazine as one of the Top Ten Bassists of All Time. After recording their break-out record Get Down! in 1999, this famed jazz trio has recorded with the likes of Chaka Khan, Dave Matthews, Talib Kweli and John Scofield. Opening for The Rolling Stones one tour and Stevie Wonder the next, there is not much this band hasn’t done. Born in England and bred in New Orleans, Jon Cleary is a prolific triple threat combining soulful vocals, masterful piano skills, and a talent for producing infectious grooves with melodic hooks and poignant lyrics. Whether performing on solo piano, with his jazz trio The Philthy Phew or alongside Bonnie Rait and John Scofield, Cleary is among the best of the best. Celebrated throughout the world by fans, critics, and many of the world’s greatest musicians, Roberta Gambarini is a Grammy Award nominee who has graced the stages of the most prestigious venues and festivals in the world. Hank Jones, who provided accompaniment for the likes of Ella Fitzgerald, Frank Sinatra, Bing Crosby, Billie Holiday and Nat “King” Cole called Gambarini the best singer to emerge in over 60 years. Twenty-two teenagers from Utah can make a lot of noise - especially when they happen to be members of the Crescent Super Band. Under the direction of founder Caleb Chapman, the band has stunned audiences worldwide, from New York to the Netherlands. With a youthful energy and nearly unbelieveable performance level, the band has performed hip, intelligent arrangements of the American standards for thousands. As a result, they have frequently been hailed as the top band of their type in the world. Two-time Grammy award winner Roy Hargrove will be the esteemed guest of honor for 2012. Hargrove is the youngest guest of honor at 42 years old and the first trumpet player. Having worked with the likes of Herbie Hancock, Freddie Hubbard, rapper Common, and English acid jazz DJ/producer Gilles Peterson, very rarely do you find a musician who plays on such an elite level across as many jazz genres as Hargrove. February 29th, so act now! For more information, visit TellurideJazz.org.